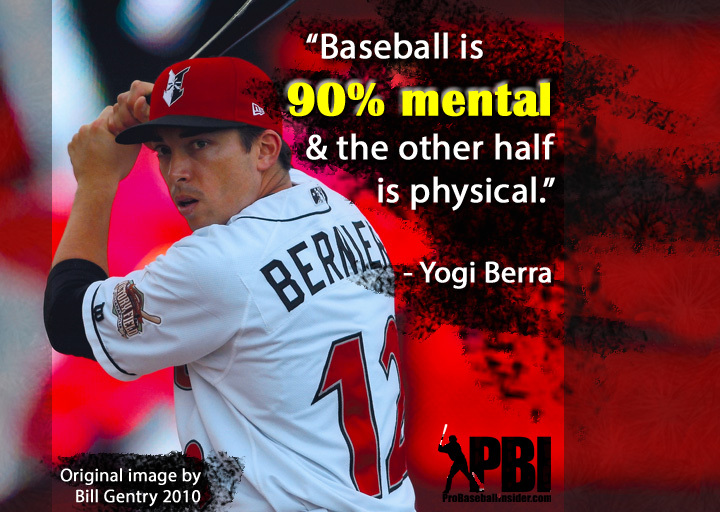 Yogi Berra once said “Baseball is 90% mental – the other half is physical.” That statement seems a little comical at first but the longer I play this game the more I believe him. He is giving us wisdom mixed in with a little comedy. Mental toughness in baseball is something that separates the greats from the talented guys who never panned out. This is something I wish I would have made a priority when I signed my first professional contract in 2002. Even though the Colorado Rockies had a mental skills coach, I didn’t give it the same attention I gave to hitting, fielding, or throwing. That was my mistake. Mental toughness is an aspect of your game that is just as important as everything you do to physically prepare. After one of our spring training workouts I was asking a few guys their opinion on what gives someone mental toughness in baseball. Most of the guys I play with now were really good in high school and college. But these guys have either not made it to the big leagues or had a cup of coffee up there but hadn’t stuck with anyone. Were they more mentally tough back then than they are now? I thought this was interesting because I hear often, that most players skills are similar (excluding the superstars) but the separator is mental toughness to bring about consistency in their play. At times I wonder if this the classic conundrum – “what comes first, the chicken or the egg?” Is someone so good mentally that they get all out of their ability or is someone so good physically that they seem mentally tough? Baseball is a game of failure…. even for the Hall of Famers. Being mentally tough, learning to deal with failure in a constructive way, is often what separates those who make it and those who don't. From experience, baseball can play tricks on your mind. It’s easy to think about mechanics and consistently try to analyze my swing and baseball situations. Anyone can agree that no matter what level sport you have played in your life, when you were at your best everything seemed easy – almost as if you weren’t thinking about anything. You reacted and things just happened, this feeling may have only lasted a short time. When you lose that effortless feeling it’s easy to over work and to over think as you try to get back that simple, smooth feeling. It seems the harder you try and the more you want it, the quicker that feeling slips away. In golf, it’s easy to hit perfect drives on the driving range. But once you step to the first tee box, your group is announced and 10 people are watching your tee shot. Suddenly nerves kick in, you start thinking a little more, and it usually becomes a little more difficult to find the fairway. 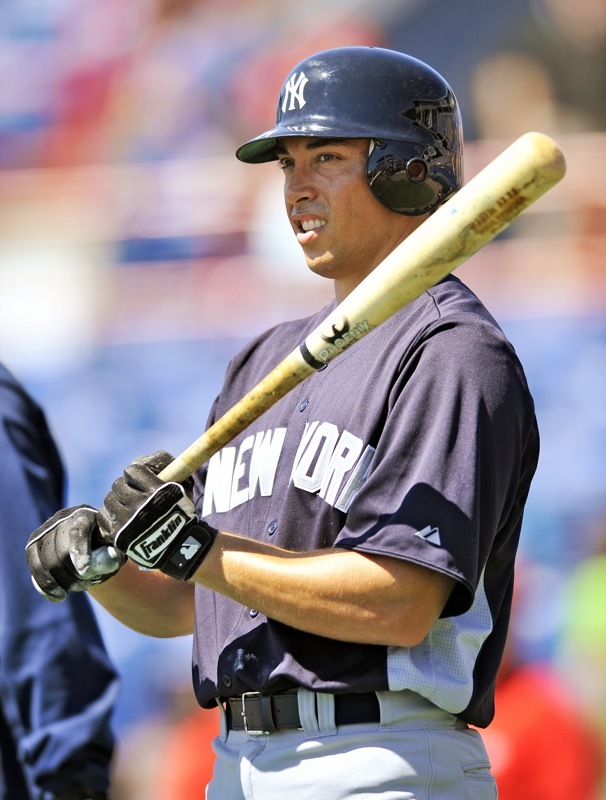 In baseball every person has one aspect of the game that comes easier to them than another. For me I have always felt comfortable with my throwing accuracy. It’s funny because this is the part of my game I think about the least, it just happens. I practice a lot but I don’t think about it come game time. However, my hitting is something I think about constantly. I am trying to work on every mechanical flaw in my swing and its a never ending process. That is the aspect of my game that is inconsistent. I know other players that can fall out of bed and hit. They don’t think about it, they seem like they were born to hit. Yet the same player goes through every mechanical throwing motion in the book and still has trouble making an accurate throw. Speaking only from experience, it seems to me that our mind gets in the way and trips us up. The million dollar question is….. How do we direct our minds so our thoughts don’t interfere with our play? I don’t have a simple answer. 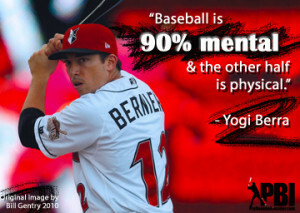 First I believe some players can “get locked in” naturally and some people need to work on mental toughness with same dedication they apply to their other baseball skills like hitting and fielding. 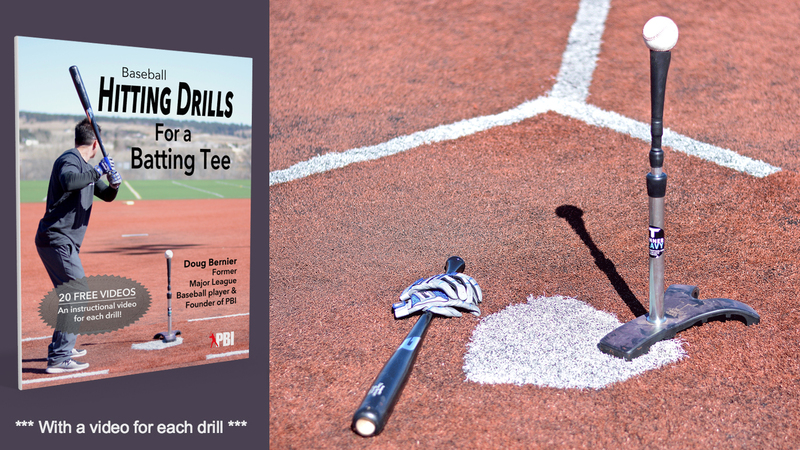 I have read many mental skill books but haven’t really applied them to my baseball career. My thought was always if I work hard my skills will be good enough to get me to the next level. But the longer I play this game the more I realize that if you don’t think correctly, everything you practice won’t translate into the game because at some point there becomes a mental block. 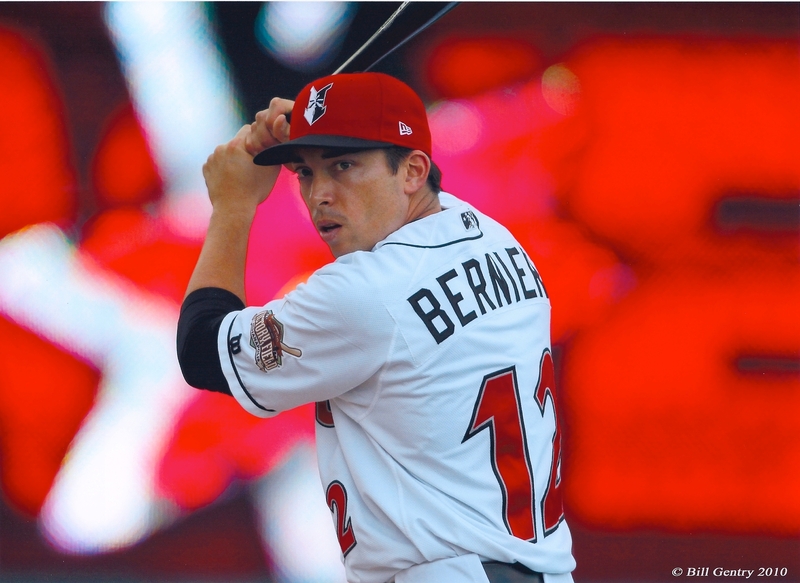 This spring I’ve been speaking with AJ Pettersen, a young minor league player who trying to move up the ranks and get to the big leagues. He takes the mental side seriously and uses techniques to get the most out of his playing ability. He recommended “The 7 secrets of world class athletes” by Steven Yellin and Buddy Biancalana to me. I am only a few chapters in but it’s changing the way I think about competing on the baseball field and more importantly in the batters box. I found in most of these books they tell you what you need to change but they don’t tell you how. For example, I know I need to be relaxed when the bases are loaded in the 9th inning with the winning run on 2nd. But how do I relax? I don’t know if this book answers this question, but I am taking this subject much more seriously than I did in the past. As I find good mental resources, I’ll be sure to pass on that info to you guys. Understanding what you are thinking about and if it will help or hurt your physical performance is something to start working on now. 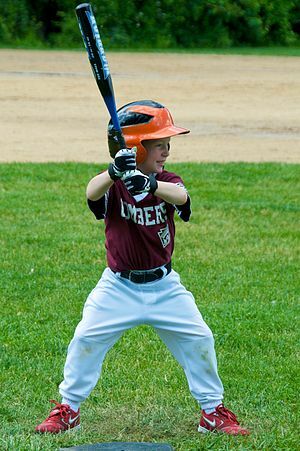 It’s never too early to start working on your mental toughness in baseball. This is something I wish I would have made a priority when I signed my first professional contract in 2002. Even though the Colorado Rockies had a mental skills coach, I didn’t give it the same attention I gave to hitting, fielding, or throwing. This is another aspect of your game that is just as important as everything you do to physically prepare. I hope this opens your eyes to this subject and through my experience I hope you are able to work on aspects that can give you a mental edge over your opponent as well as get the most out of your physical abilities. Purchasing this for my teenage son right now. Thanks for your insight and I look forward to the follow up. Did you finish reading this book? 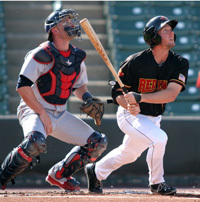 Any additional insight to share regarding your experience with developing your mental side to baseball? Appreciate all of your efforts and insight thus far! Thanks! I have finished the book and it is one book I highly recommend. I like it so much because they talk to athletes. It is not the same if someone is telling you how to “lock in” or “calm the emotions” if they never have been in that position. I still feel in the off season I have figured out how to control my emotions and then once I step in front of 40,000 people its a bit different and not as easy as I planned. I will do a follow up article pretty soon, I want to review the book again since its been over a year since I finished it. One thing that I have been doing recently that has really helped me while playing defense. I will talk to myself through what is happening on the field (similar to a broadcaster) I will say the count and how many outs and talk about the pitcher going into his windup. I notice when I focus on the game and what is happening at that moment I don’t have time to think about external factors of nervousness or fear of messing up. It seems a little weird at first but its been very helpful. Thanks for your kind words and I’ll be sure to write up a follow up article on the book.